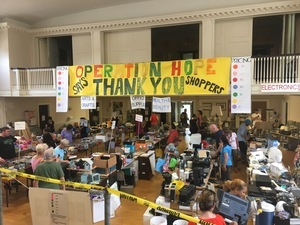 "We at Operation Hope of Fairfield express our thanks to the community for its support of our 29th Annual Tag Sale, which took place August 18-19. Your generosity helps us provide food, clinical support, affordable housing and hope for the future for so many. Thanks to First Church Congregational for loaning the space to hold our largest annual community-wide event. From the nearly 300 donors who contributed merchandise to nearly 1,800 shoppers and over 350 volunteers of all ages, thank you! We are honored to work with you to support our neighbors in need. Deep appreciation for our Tag Sale Committee, tirelessly chaired by Rob Greenbaum, Dawn Hiltz, Mike Logan and Volunteer Program Manager Donna Schmidt. And thank you to our Department Chairs: Lisa Bond, Joyce Bultman, Ken Camarro, Tom Camarro, Kate Carroll, Celeste Davis, Joyce and Tom Flynn, Shirley Furniss, Linda Goldstein, Phil Herr, Mary Goodman, Eleanor Gonzalez, Judi Heath, Cara Hunter, Mary Kulcsar, Sharon Rehme, Beth and Hogan Love, Joleen Marren, Sheryl Shaughnessey, Jeri Sulik, Pat Thomann and Gail McQuarrie. Thanks to our special helpers: Alice and Jerry Krenke, Irene Kubik, Fran Glucroft, Judy Arel, Carin Anderson, Brenda Kupchick, Trudi and Stacey Durrell, Maureen Reynolds, Lara Linsenmeyer, Cathy Kochi, Andrew McKinnis, Sam Bove, Bob May, Colleen Barker, Gabi Camarro, Olivia and Sofia Cholewczynski, Ursula Deluca, Alexandra Gordon, Andrew Hiltz, Lori Martin, Christian Martin, Margaret O’Brien, Rob Bon, Sharon Risley, Kim Ryan, Jennifer O’Neill, Tanya Reis, Debbie Thunberg, Barbara Simpson and Mike Zembruski. And thanks to all our wonderful and dedicated Operation Hope volunteers, staff and Board members! Thank you to the following businesses, community partners and individuals: Al’s Warehouse Liquor Store, All American Waste, Black Rock Galleries, Boy Scout Troops 82, 88 & 90, Chip’s Fairfield, Club Pilates Fairfield, Deacon Dan Ianniello, Doughnut Inn, Equinox Southport, F45 Training Fairfield, Fairfield HamletHub, Fairfield Police Department & Special Traffic team, Fairfield Rotary Club, Fairfield DPW, First County Bank, Gaelic American Bag Pipers, Gold Coast Liquidators, Harry’s Wine & Liquor Market, Henry C. Reid & Son Jewelers, Mo’s Wine & Spirits, NCL Fairfield & Ridgefield, People’s Bank, Pivot Ministry, SASO Boys & Girls (Fairfield), Sound Runner, Sport Hill Farm, St. Paul’s Episcopal Church, Sturges Ridge of Fairfield, Super Duper Weenie, The Pantry, UHAUL, Village Bagels, Warde High School Football Team, Webster Bank, Westy Self Storage. We apologize for any unintentional omissions or errors. We are grateful to all who helped!